The National Mall appeared less crowded today than it did eight years ago. 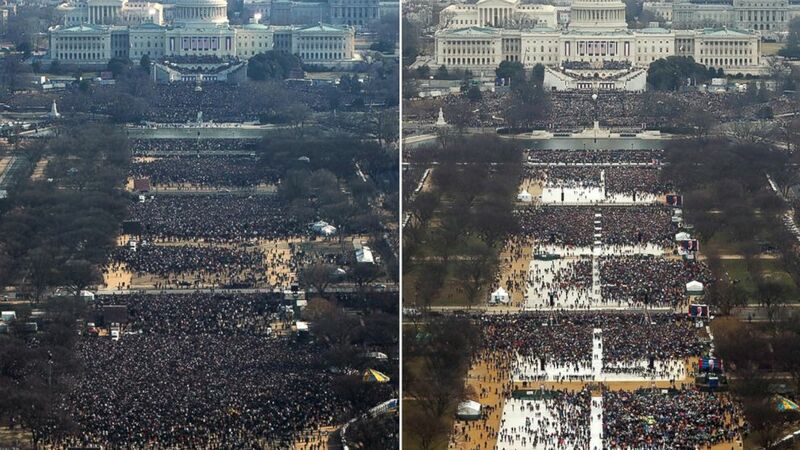 The National Park Service won't be announcing attendance numbers for President Donald Trump’s inaugural ceremony, but photos of this year’s event indicate that it may have been less well attended than Barack Obama's in 2009. 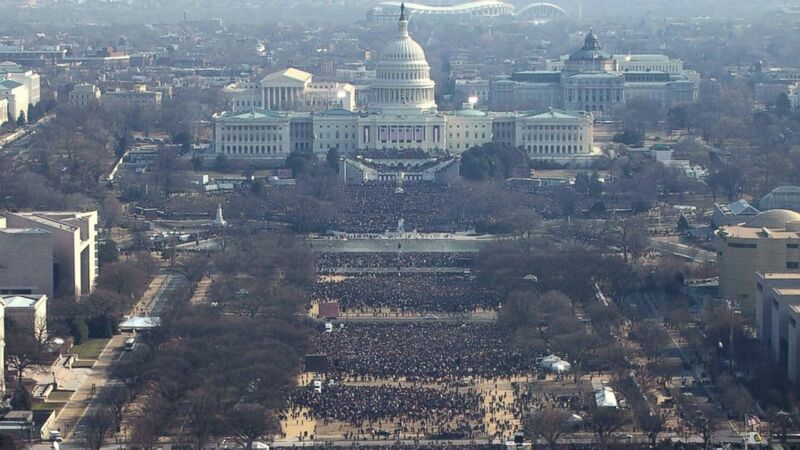 There were 1.8 million people who attended Obama's inauguration in 2009 and close to 1 million who attended his second in 2013, according to D.C. officials. 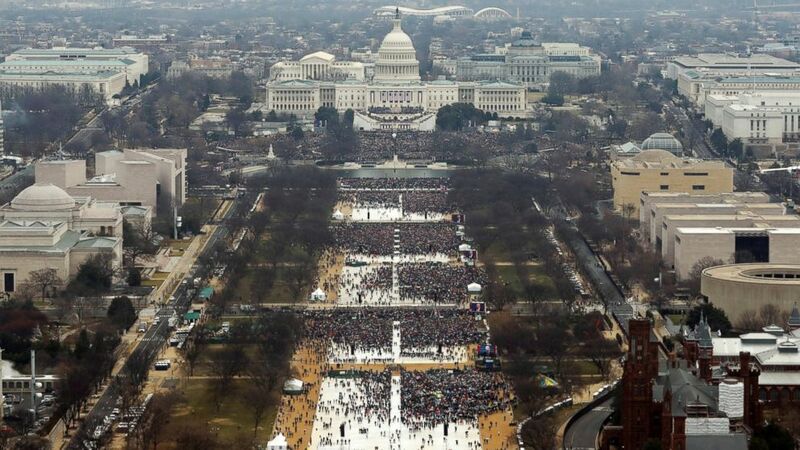 Before today's festivities, federal and District of Columbia officials estimated 700,000 to 900,000 people would attend Trump's inauguration. The D.C. Homeland Security and Emergency Management Agency said it was planning for 800,000 to 900,000 people to attend the inauguration. Here is a side-by-side comparison of Obama's 2009 inauguration and Trump's. Both were taken from the same viewpoint: the top of the Washington Monument looking toward the Capitol Rotunda, showing the area of the National Mall from adjacent to the Smithsonian Institution Building up to the Capitol, an hour apart on the respective days. (Getty Images | Reuters) At left, President Barack Obama's 2009 inauguration at approximately 11AM. At right, President-Elect Donald Trump's 2017 inauguration at approximately 12PM. The district’s Metro system was less inundated this morning than it was during Obama's first inauguration. As of 11 a.m. ET, the Washington Metropolitan Area Transit Authority says it had recorded 193,000 trips, compared with the 513,000 trips taken up to that time on Jan. 20, 2009. Some 317,000 trips were taken by 11 a.m. ET on Obama’s second inauguration on Jan. 21, 2013, the government agency said. The photo below of Obama's inauguration was taken on Jan 21, 2009, at approximately 11 a.m. ET. At this point, members of the House and Senate were formally introduced, but the Obamas were still inside the Capitol. (David Stephenson/Lexington Herald-Leader/MCT/Getty Images) Thousands gather at the Washington Monument for the inauguration of President Barack Obama as 44th U.S. President in Washington D.C. Jan. 20, 2009. Picture taken at approximately 11AM. The below photo of Trump's inauguration was taken today at approximately 12 p.m. ET. Trump took to the podium shortly after to give his inaugural address. (Lucas Jackson/Reuters) Attendees partake in the inauguration ceremonies to swear in Donald Trump as the 45th president of the United States at the U.S. Capitol in Washington, Jan. 20, 2017. Picture taken at approximately 12PM. By the time Trump took his oath of office, temperatures were in the mid-40s and approaching the 50 degree mark, according to ABC News meteorologist Melissa Griffin. The sky was cloudy, and the rain held off until the 45th president began his inaugural address. Eight years ago, during Obama's inauguration, it was a frigid 28 degrees Fahrenheit, with wind chills in the mid-teens, according to Griffin. Editor’s note: ABC News had reported earlier that the side-by-side comparison photos were taken from the viewpoint of the Smithsonian Institution Building commonly known as the “Castle.” The photos, in fact, were taken from the top of the Washington Monument. ABC News' Dee Carden, Phaedra Singelis and Jeff Swartz contributed to this report.